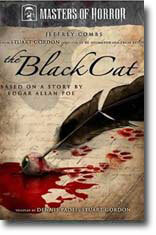 The Black Cat is a fantastical tale based on the life of one of the most prolific literary icons in history. Directed by the legendary Stuart Gordon, this film is a gut-wrenching, soon-to-be horror classic. A stunning mix of eloquent beauty, cringe-inducing horror, pristine cinematography and dynamic performances makes this macabre masterpiece one of the most anticipated releases in the Masters of Horror library. The episode features Jeffrey Combs (always a delight) as Poe. Struggling and impoverished, he lives in a dark and unpleasant dwelling with his ill wife. Attempting to sell his poetry to survive, he is also sinking into desperation, alcoholism and insanity. There really isn’t much more plot than that–this is a story that is reliant on mood rather than narrative. Combs does well with the various aspects of Poe’s dementia and there is plenty of macabre humor interspersed. Haunted by visions of his wife and menaced by household pets, there are moments of real gruesomeness and gore to be appreciated. I enjoyed the film’s literary references and setup as a fan of Poe, but some may find the beginning a bit slow. The tale takes a while to develop–but that never bothered me. The ending does maintain a frantic pace and has some great effects, but if you’re a lover of animals–you might want to steer clear. Combs is a uniquely engaging actor and this is a must-see for his fans. This film was part of Masters of Horror, a television series that was an informal social group of international film writers and directors specializing in horror movies and an American television series created by director Mick Garris for the Showtime cable network. The rirst episode aired October 28, 2005 and the final episode aired February 2, 2007. Character to watch: Jeffrey Combs as Poe.